What is "Just Married" Car Plate? "Just Married" car plate is a car plate that tells the world of your "happy status". This plate originates from western countries which are generally used to be tied to a horse carriages or behind the bridal car with empty aluminium cans which are being dragged while driven. Now, we have came out with acrylic-made "Just Married" car plate designed especially for newly married couples for their car decorations and as a wedding favor which the couple can frame it up on their wall for years to come. Do take note that this is not a metal plate. And of course, many of our clients who purchased from us bought from us again as a wedding present to their friends who will be getting married! Take this opportunity to be different and make your wedding day a memorable one! 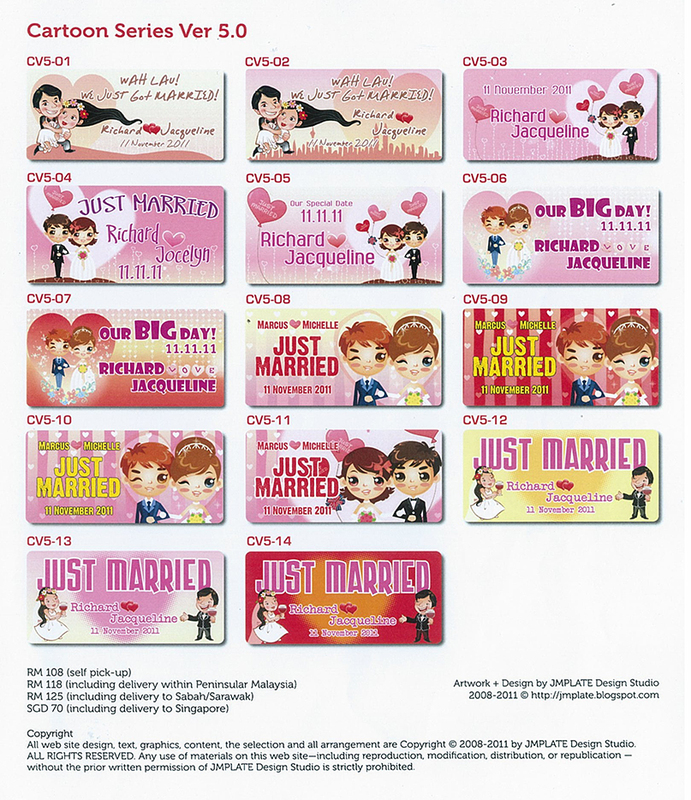 - We have the LARGEST selection of "Just Married" car plate in Malaysia & Singapore. - We can deliver via courier to you within 2 working days once your artwork is confirmed and payment is made. - We can ship the "Just Married" car plate all over the world. - Clients can walk-in to our office in Bandar Sunway to choose the design and select the artwork during office hours (Mon-Fri) except weekends (Sat/Sun) & public holidays. - We can customize your "car plate" provided you give us your ready designed artwork in Adobe Illustrator. Do not worry we will not reproduce your own design. - We have made hundreds of married couple wedding day a memorable one! Our "Just Married" car plate designs and image has been used by a few companies recently. One of them is a well-known Malaysian publication company and so far the issue has been settled. Another company in Singapore has since copied or reproduced all our designs almost 98% earlier this year and we will not hesitate to take legal action against them. Therefore, we would advise to companies or individuals not to copy our designs. Copyright issues can be read on this link regarding the appropriate use of the images and for reproduction of the artwork. Step 1: Browse through our "Just Married" car plate designs. You can "click" on the images on the right to view a larger image of the designs. Only then you will be able to see the "code number" for better selection. Wait for our reply via email or SMS on payment method, delivery charges. Note that these car plates sold is based on one (1) plate to be decorated in front of the car or the back. If client request to order two (2) similar plate, then the price is times two (x 2). Make payment (bank-in / online-banking / online-transfer) to our Maybank (Malaysia) account or POSP Bank (Singapore) account or you may pay to us via Telegraphic Transfer (T/T) if you are from overseas instead of Western Union as it will cost more for you should you decide to use Western Union. Please write to us regarding the courier charges. Step 5: Please send us a notification after payment done.By sending an email to mailto:jmplate@gmail.com or SMS to Michelle at +6 012-204 2207. For any enquiries, you can always e-mail us anytime and we will get back to you ASAP! -We will only accept/proceed the orders for those who have made the payment. - There must be someone to collect the item when the courier service company personnel reach at your doorstep. Remember!! - We only mail via Skynet / OCS. We charge minimum RM 15 (Peninsular Malaysia), RM 22 (Sabah/Sarawak/Pangkor Island/Langkawi) and RM 50 (Singapore). This is for one (1) item (Just Married car plate only) or any combine item less than 1 kg. If you have multiple items, courier charges varies depending on weight. Please enquire before placing order. - For Malaysia client: if you wish us to courier to you, the "Just Married" car plate will be sent to you the following day after the payment is received/cleared (with the exception of Saturdays, Sundays and public holidays). - For Singapore client: it may take up to 2 to 3 working days (except Saturday, Sundays and public holidays) to reach Singapore as the parcel require custom inspection. This does not apply to overseas clients as it requires custom inspection. One of our client from Canada received the "Just Married" car plate exactly 2 weeks after we courier the parcel out. :- if changes made and still prefer the original design, we will still charge you for the additional changes. Therefore, best to stick to our existing templates. TQ! For "fridge magnets" or "button badges", additional RM 10 to be added for any additional modifications. We would advise client to call us or drop us a line before you swing by. Copyright on all of the material on this site belongs to JMPLATE Design Studio unless stated otherwise. You may copy material once for your own private or domestic use, otherwise no part of this website may be copied, reproduced, published, distributed, downloaded, modified or otherwise used in any form including electronic copying without the express permission of JMPLATE Design Studio. Any infringement of the images from this website, we will not hesitate to take legal action against the company or website. Button Badges/Pin is our latest product which is extremely popular for actual day as the "heng tai" (male buddies) and "chi mui" (female buddies) will wear to identify themselves as which "team" they are from. The old traditional way was using a wrist band for the bride's team and the groom's team will wear uniform or a tie to differentiate but they have since added additional item :- which is the button badge/pin to add more spice and fun into their actual day wedding event in the morning. Get them now by choosing the designs according to the code in our product list. We have made thousands of Fridge Magnets as wedding favors for our clients. The fridge magnet are customized according to your name and wedding date so that it can be given as gift during the wedding day reception. Each and everyone of your guest will appreciate they have something to bring home and you will be amazed that all your friends and relatives will wish you "Happy Anniversary" on your wedding day as they will remember your happiest moment of your life. For more info, e-mail us at jmplate@gmail.com for more enquiry. We can courier directly to you doorstep anytime, anywhere.